Need a book to spark great discussion and get your kiddos thinking about making good choices? Then this is the book for you! Perfect for the beginning of the school year. "Why am I Here? 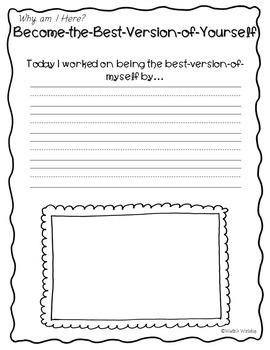 A story about becoming the-best-version-of-yourself!" 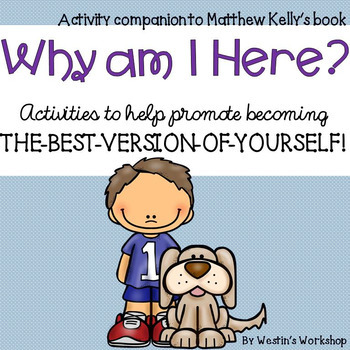 is a fantastic book that gets children thinking about positive behavior and teaches self-reflection. 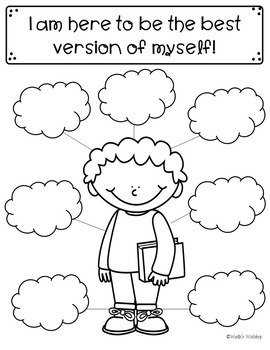 I've created SIX activities to go along with the book and help promote positive thinking. They are all differentiated to include regular lines, belted line, or space for younger children to create illustrations. Along with the various activities, there are bracelets students can color and wear as a reminder to always be working on becoming the-best-version-of-yourself. 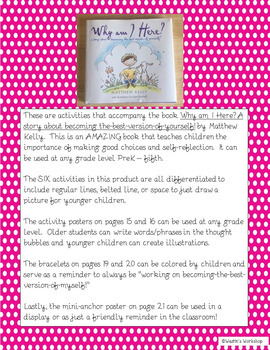 There is also a mini anchor chart that can be used in a display. These activities can be used at any time of the school year with all elementary levels. Please take a look at the preview for everything that is included! I would greatly appreciate your feedback below if you purchase this product!